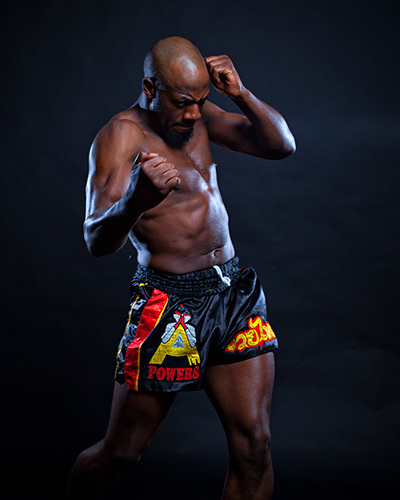 A real beast of a fighter, Remi is a former weightlifting champion who discovered Muay Thai almost by accident in 2013. Originally joining All Powers to shed weight, Remi was convinced to give Muay Thai a try one day and found himself infatuated with the sport after just a few training sessions. He enjoyed Muay Thai so much and gained so much confidence in himself that he decided to begin fighting competitively. By the turn of 2016, Remi had won of 9 of his first 11 fights, feeling stronger, fitter and more capable than ever before. Remi genuinely believes he could become an Area European or World Champion one day in the future if he continues to train hard. He holds Panicos in extremely high regard for coaching him up from beginner level to the formidable fighter he is today, and believes the support he’s received from the All Powers gang (Eric, Tony, Mike, Nick, Dan, Kane) and his family at home are the reason for his success to date.